This week, the children in room 2 have started writing in copy books. On the first page, they practised writing their own names and drew detailed pictures of themselves! 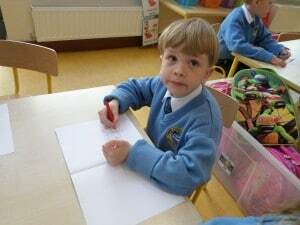 Over the next few weeks, the children will continue writing short sentences and drawing pictures. It’s just amazing to see them writing so independently now, when at the beginning of the year they were just learning how to channel and trace each of the letters.